April 4, 2018Comments are closed. 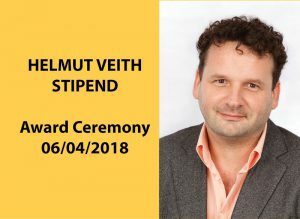 The annually awarded Helmut Veith Stipend for female master students is dedicated to the memory of an outstanding computer scientist who worked in the fields of logic in computer science, computer-aided verification, software engineering, and computer security. Helmut Veith, who tragically passed away in March 2016, was a strong advocate and mentor for women in computer science. His great polymathic mind interested in application of formal and logical methods to problems in software technology and engineering, resonates in his legacy. The Helmut Veith Stipend was established with generous support of TU Wien, Wolfgang Pauli Institute and with contributions by family and friends of the late Helmut Veith. Application for Helmut Veith Stipend 2018/2019 is open. Download the flyer here.